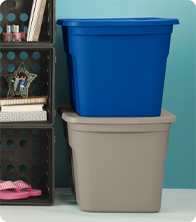 Get organized with the 18 Gallon Tote. This popular size tote is ideal for a variety of basic household needs, such as sorting and storing away clothing, toys, linens, craft supplies, seasonal decorations and more! The lid snaps tightly to the base, keeping contents contained and concealed. The in-molded handles provide a grip for lifting and carrying, making transporting the tote easier, whether moving into a dorm or storing away belongings in the attic or basement. The indexed surface of the lid allows multiple totes to stack neatly on top of each other for efficient use of vertical storage space. The classic styling offers a refreshing, clean, and coordinated look. The overall dimensions of this item are 23 1/2" x 18 3/8" x 16 1/8". 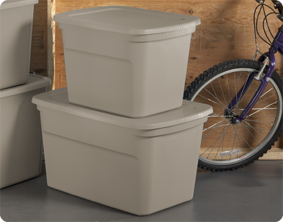 Overall Assembled Size: 23 1/2" x 18 3/8" x 16 1/8"
Totes help contain and conceal items such as sports equipment, camping supplies and more in the garage, basement or attic and offer a clean appearance. Totes create a simple means to keeping your things organized and stored away! Bring order to your dorm room or bedroom. Totes make moving easy and provide a simple storage system when you arrive! 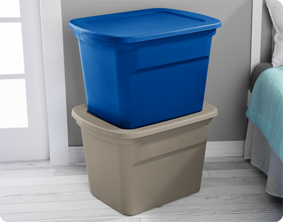 18 Gallon Tote is rated 4.1 out of 5 by 29. Rated 1 out of 5 by rozco53 from What happened to the quality? I have been a long time purchaser of these 18 gallon totes. I'd say I own about 200 plus. I decided to purchase them and use them when I moved instead of using cardboard boxes. I figured they would always come in handy for whatever reason. I was a good investment. The prices were decent and the quality...oh man the quality USED to be AWESOME. I mean I still have the older style bins that I purchased back in 1995. They've been through storms.. snow.. outdoor sun and exposure... cross country moves and storage ins and out and about 5 other moves that I can think of now... and STILL are going very strong... BUT these newer version of 18 gal totes are flimsy... weak... break easily and have yet to prove your business worthy any more. Extremely disappointed in who ever decided that making more money meant lowering your quality. Rated 1 out of 5 by Margie from Terrible design and qulity This tote has too wide of a top - it cannot hold up to any weight at all and the lid does not fit once it gets benteven a little bit. We have had totes made by sterlite for 15 years that are still in better condition than the ones i bought last month. Best Sterlite Tote ever made was Tote #1830. PLEASE make these again. Palstic is more durable and the design is the best. Rated 1 out of 5 by elsajean from Durability is horrible I bought 50 of these totes for a move in a couple of weeks, I bought from this company because I thought it was reputable compant just to find out it wasn't, So far 15 lids have broke and according to sterilize they don't make extra lids in case this happens, I have approached them several times and only received 1 return message stating just that. I paid 5.99 per tote so you would think they would stand behind their product. I will not buy their product again and they will be getting all 50 totes back, so that will be a refund of 299.50, a bad review, a dissatisfied customer. Rated 5 out of 5 by JackieDog from AMERICAN MADE!!! I like the quality of Sterilite products but my favorite part is they are American made. Of all of the products I have purchased the lid always fits tight. They also stack well. Rated 1 out of 5 by Jess121 from New design is not worth your money I have used sterility containers for many years and since the new design came out the containers are very flimsy, break and do not stay closed. Horrible. Will not buy containers again. Rated 5 out of 5 by Mary T. from Great storage Love this tote for storing seasonal clothing in my camper and attic! Rated 1 out of 5 by nitroterror from No good. These 18 gallon totes feel very shy of their predecessors. I have used sterilite 18 gallon totes for years. I have over 110 of them. My local retailers started carrying only this style. I had been using the (1830) design. So I figured why not try the new design. These now do not stack with my old totes. (Guess that's my OCD problem). So I got over that. But stacking them soon revealed their flaws. Much weaker. I used to stack old style 5 high. With these, Same weight only three high. Don't waste your money.